The November 2016 State of Oregon Economic Indexes of was released today. Full report is available here. We thank KeyBank for their generous support of this project. 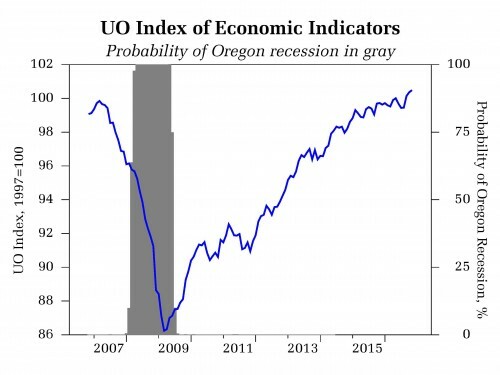 The Oregon measure of economic activity fell to 0.51 from an upwardly revised October figure of 1.22. The three-month moving average, which smooths month-to-month volatility in the measure, was 0.65 (“zero” indicates average growth over the 1990-present period). Only the construction and household sectors contributed positively to the measure in November. The manufacturing sector made a neutral (zero) contribution. The construction sector was again buoyed by the employment component. Broad labor market indicators suggest continued job growth. Still, job growth has slowed, as is evident in the service sector. Employment components within that sector were almost all neutral or negative; only the financial services employment component made a significant positive contribution. 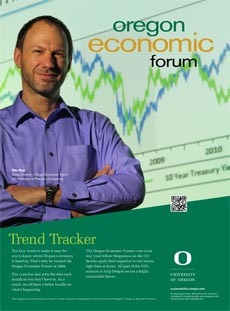 The University of Oregon Index of Economic Indicators gained for the fourth consecutive month in November, rising 0.1 percent. Employment services payrolls (largely temporary help workers) rose sharply. This, along with still low levels of initial unemployment claims, points toward ongoing job growth. The interest rate spread widened further as market participants priced in stronger economic growth in 2017 and with it an increased likelihood of additional interest rate hikes on the part of the Federal Reserve.